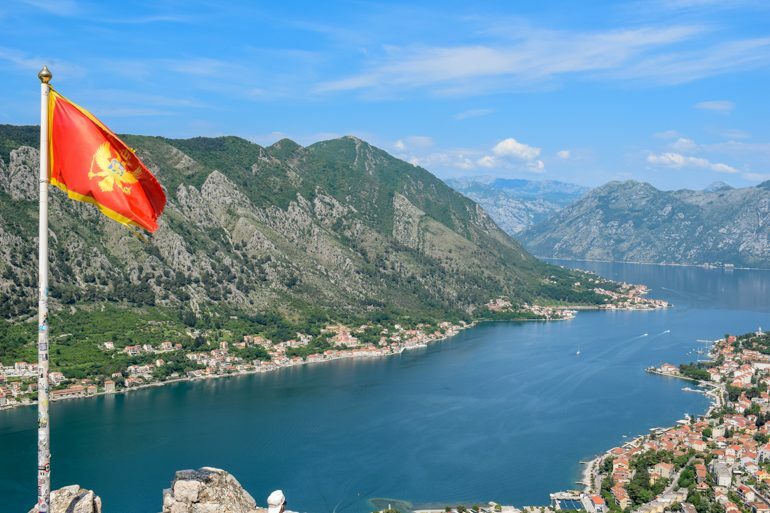 Some of the Best Things to Do in Kotor, Montenegro! We should start off by saying that we loved Montenegro. Having never visited before when we flew into the capital, Podgorica a few months ago, we knew there was something special about the country. It is the Montenegrin coastline along the Adriatic Sea is what draws people in year after year. The Bay of Kotor is beautiful and we are so glad we stopped to see the small town of Kotor. We visited Kotor on our way from Croatia to Tirana, Albania. 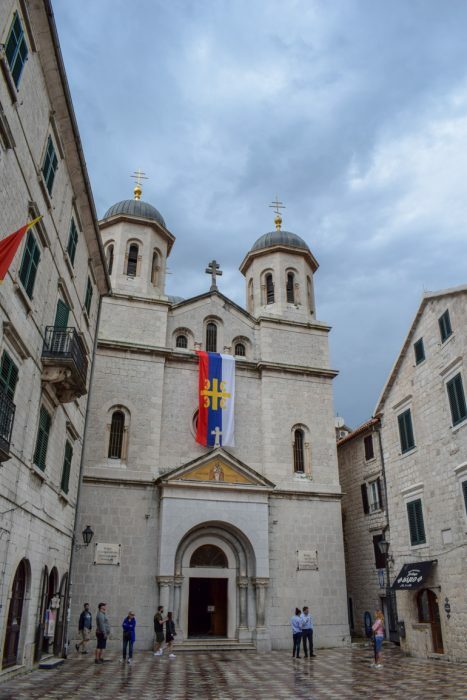 You can read about the journey on the bus ride down from Dubrovnik to Kotor! The whole area is really beautiful and definitely worth a visit. Seeing the ocean and the tall mountains so close to each other makes for an incredible view that leaves you in awe. Seriously – it’s hard not to look up and go “holy crap that’s beautiful”. Finding things to do in Kotor might take some planning since there aren’t that many things to do. Lots of things you’d end up doing take a bit of planning because they are day trips, boat trips, or day hikes to other places in the area. 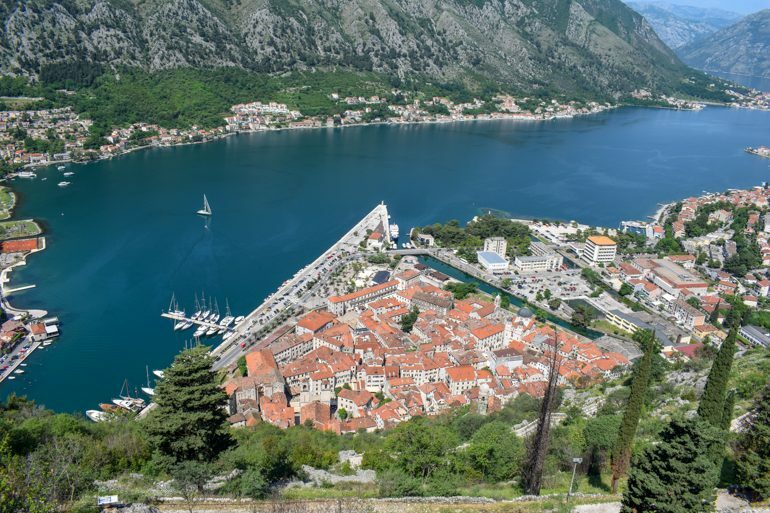 Many people are visiting Kotor on a cruise ship since Kotor is a popular cruise port. So, there are things to do in Kotor from a cruise ship in the Old Town like shopping for Kotor goodies like local artwork. 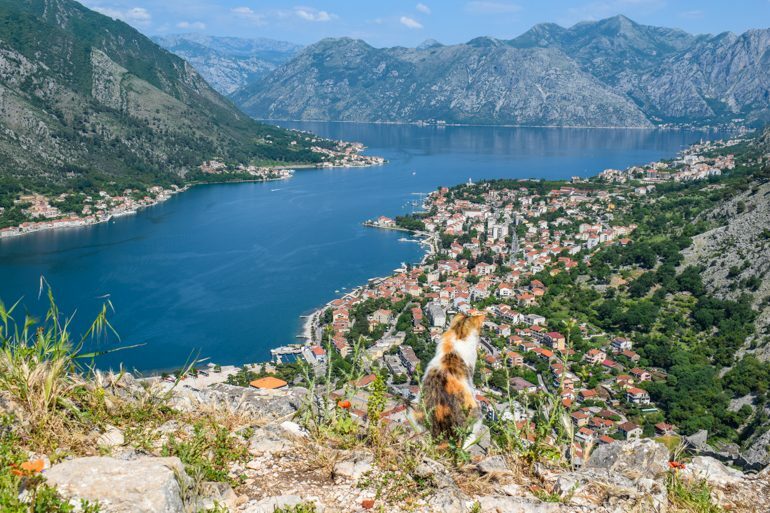 There are even some unusual things to do in Kotor like visit the Cat Museum – but we will get to that! If you want to see what we got up to in Kotor, watch the video snippet below. You can also watch the whole video on our YouTube Channel here. 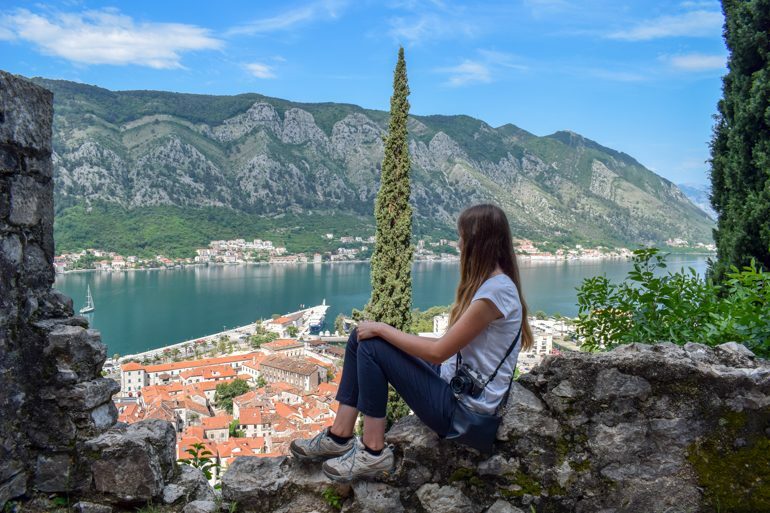 If you’re planning to visit Montenegro and explore a few different places like we did – then you can check out our guides to what we did in other cities and towns. Hopefully, these help you with the journey! Discover the capital city – See Why Podgorica Isn’t That Boring! Staying by the Coast? You should definitely check out Herceg Novi. It’s not too far from Kotor! Heading down into Albania? A stop in Ulcinj, Montenegro might be worth your time. So, if you’re Here is our take on day trips, hikes, churches, and some of the best Kotor restaurants so you know where to eat in Kotor. 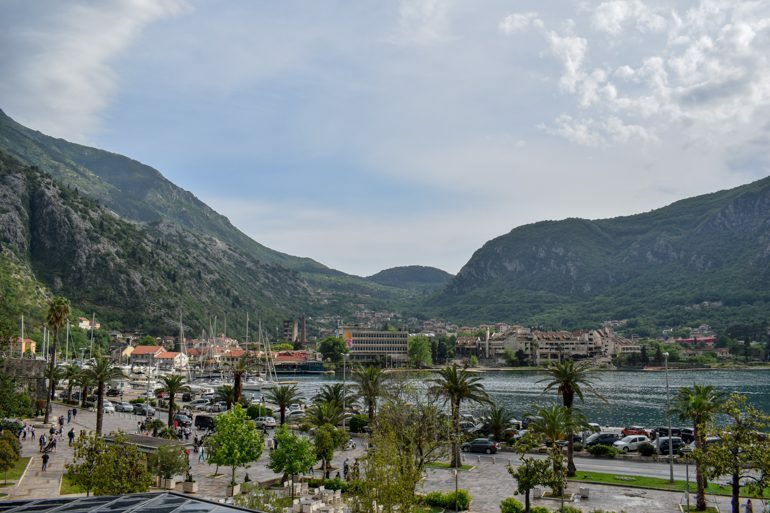 Ready to explore Kotor? Here we go! There are lots of options from guesthouses to actual hotels both along the coastline and within the old town. 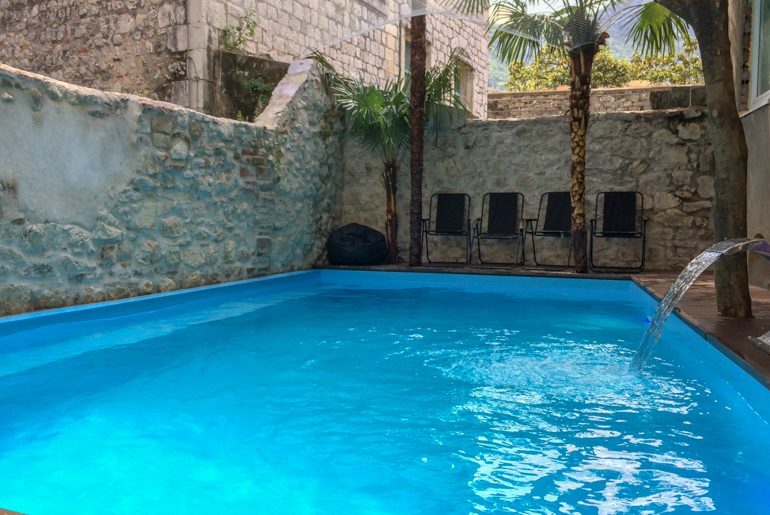 If you need a place to stay in Kotor you’re bound to find a nice one in the old town. You can check for Kotor accommodation here. Straying from our usual course of booking Airbnbs, we booked a few hostels over the four months we were on the road in the Balkans. In Kotor, we stayed at Old Town Hostel which, is as the name suggests, is in the Old Town of Kotor. We really liked our stay – so much so it made our list of 27 hostels all over Europe that we loved. We booked a private room and only later found out that it was technically a party hostel – oops! However, the hostel is split up into several separate buildings and the place where the private rooms are located actually very quiet. So you can decide whether you want to socialize and party or not. Nothing fancy but for budget travellers this private room with seating area was luxury! There were actually other couples that stayed there (in our wing) but didn’t participate in any activities. Since the private rooms were in a separate building that’s very easy to do. We decided to interact a bit more – so hung out in the common room and went on a boat cruise – but didn’t really “party” or go out. We really enjoyed this balance of a quiet place to sleep and a fun group of people to engage with – and we can only recommend the hostel if you’re looking at renting a private room. We honestly can’t speak about the dorm style rooms but heard that they were like any other hostel – comfy, well-equipped, and sometimes noisy. After years of dorm rooms, though – Eric was fine in the private for a change! The pool was just opened and it was pretty cool to be able to cool off at the hostel. If you want to stay in a dorm, you should know that there is a bigger party atmosphere and it is not that easy to escape. 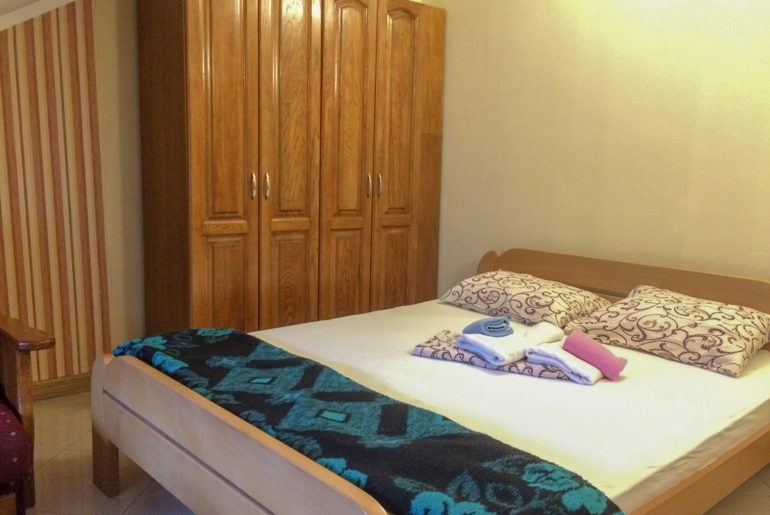 But, if that’s what you’re looking for Old Town Hostel is definitely for you! The location can not be beaten, the staff is friendly and helpful with great advice on food and activities. You can check out if the Old Town Hostel has availability on Booking.com or on Hostelworld if you prefer that platform! 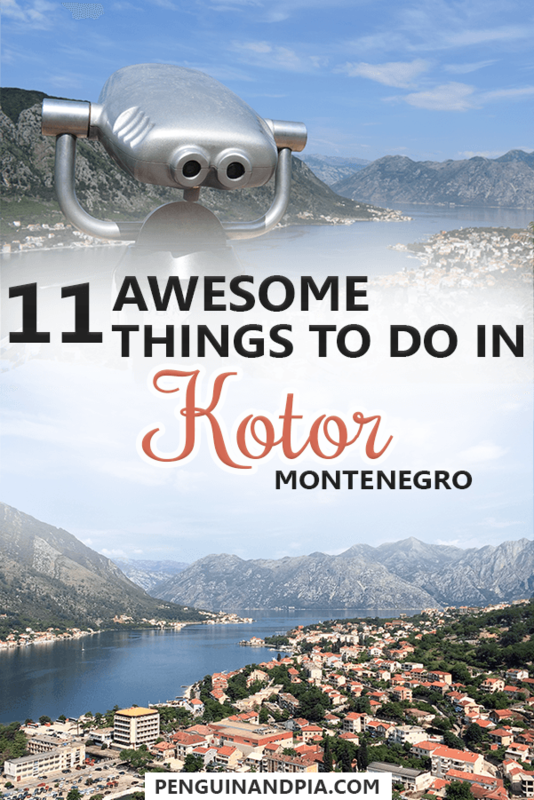 Like we mentioned above, there are lots of things to do in Kotor but many of them are day trips or things you actually do outside the Old Town. So, keep this in mind when you plan how many days you want to spend in Kotor. Looking up into the Fortress – it’s quite the adventure! This was easily one of the highlights – if not the highlight for us while in Kotor. The view from the top is incredible – just look at the photos and you’ll understand why. It doesn’t take super long to hike up there but in the summer it can get quite hot so we’d recommend you do it either early in the morning or later in the day since there is not a lot of shade. Also, don’t forget to bring enough water! Lisa sitting pretty enjoying the view of the Old Town down below. They recently started charging an 8 Euro per person fee if you enter the path from within the Old Town to take the stairs up to the fortress. However, we also know that there is a free path that takes you up there if you’re not willing to pay. You have to leave the Old Town out of the North Gate of the Old Town. Once out, head down the river bank towards the mountain, between some smaller buildings, and you’ll see the zigzagging path rise in front of you. 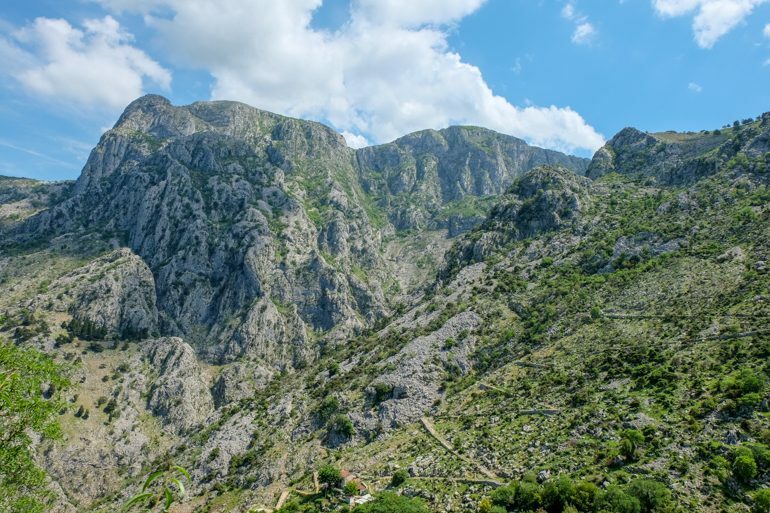 You take that – which is technically the “Ladder of Kotor” hike that we talk about below – and then when the path splits towards the fortress, take it! Unfortunately, we can’t give you any more details about where exactly this path starts since we didn’t take it ourselves. The bell tower of the Church of Our Lady of Remedy greets hikers on the path. If you go the way we went, you’ll have a combination of large steps and the flat path to get up to the fortress. You’ll pass the church, seen above, on both the way up and down. It’s a nice place to stop for a few photos and a water break. On this pathway, there were men selling bottles of water out of coolers for a few euro so if you DID forget water and had some cash, you might be able to buy some. On a hot day, however, we’re sure these guys sell out. Have some leftover change? Why not check out the view through the classic viewfinder? Overall, we’d say that hiking up to the fortress was one of our favourite experiences of the entire few months travelling the Balkans. It was one of those things you do that puts things into perspective as you travel. Maybe it was the grandeur of the mountains and the Bay below, but you kinda realize how small you are in this world when you’re up there. You also realize how beautiful the world can be – and that’s always a nice realization. The port at Kotor is busy when there is a cruise ship parked! We did a boat tour with the hostel and it was actually a really great day out on the water. The one that we did, admittedly, was more of a booze cruise but there were lots of people (us included) who only had a few drinks and people who had A LOT of drinks. To each their own! We got to swim and generally meet other travellers and share stories which was nice. If you wanted to take a tour that was just a normal sightseeing tour with swimming and a guide, then there are lots of companies advertising down by the water. We trust Get Your Guide, so here is a similar boat tour that allows for snorkeling and seeing the famous Our Lady of the Rocks – which we mentioned below. From above, that’s the entire medieval Old Town. Pretty cool to explore! Once you’re in Kotor, just wandering the old town is an experience in itself. As soon as you cross through the gates, you’re brought back in time and it’s a very cool setting. 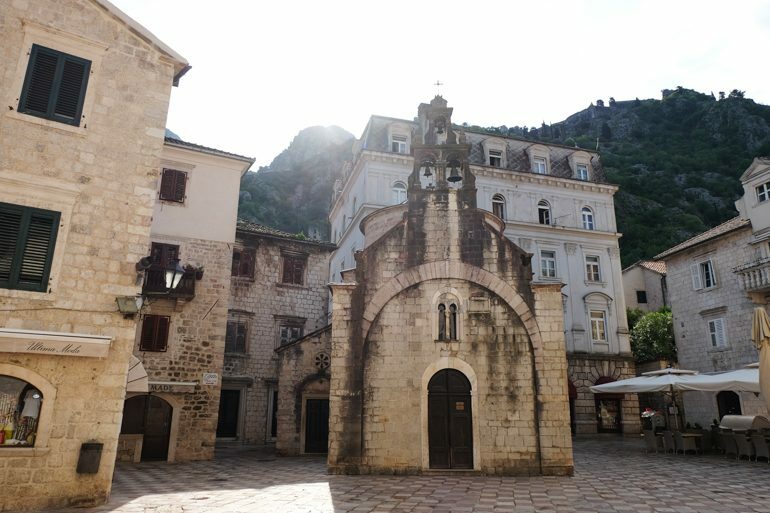 If you wanted to learn about the history of what you’re wandering by instead of just walking by things, you might even consider taking a guided tour of the Kotor old town. We didn’t, and looking back we kind of wish we had since there quite a to of history we probably missed and walking tours had been a good idea thus far in the trip. There are 10 cevapi (sausages) inside with onions and it was SO delicious. This place was suggested to us from the hostel and we are so glad we went. If you like meat, this is the place for you. You can certainly order vegetables and other salads but meat is definitely the way to go. It’s grilled fresh right in front of you. They have a small indoor seating area in the storefront but there is a larger patio area with lots of seating around the side and back. We had cevapi, the Balkan-style beef sausage that we ate in basically all the other Balkan countries that Eric absolutely LOVES. Seriously, we won’t stop talking about eating cevapi and we are already back in Germany. Address: Suranj Bb, Kotor – it’s near the roundabout at the south end of the old town by the bus station. Because of the rich history of the area, there are lots of places of worship in the old town and in the surrounding areas. Within the old town, you’ll see quite a few of them just by exploring on your own. Saint Luka’s Church is among the most famous in the Old town. Originally built in 1195, different religions have taken turns over the centuries hosting their followers. We saw a guided tour wander inside so we aren’t sure if you can just walk in for free or if you need to be part of a group. Definitely worth checking out if you’re into churches. Two of the larger places of worship are Saint Nicholas Church and the Cathedral of Saint Tryphon. Again, if you’re wandering the old town you cannot miss these two. The square in front of the cathedral was filled with people taking photos and you can definitely walk inside since we say many people do so! You can’t go to the Montenegrin coastline without trying a seafood-based dish. Knowing this, we grabbed two friends we had made at the hostel and went for a nice dinner in the Old Town. At first, we had a hard time finding the location since it’s tucked down a side alley. Once we found it and sat down we knew we were in a good spot! Cesarica has really good reviews – Eric had a seafood pasta while Lisa had a squid ink seafood risotto – but all the dished ordered were really good! Apparently, there is a beach nearby in Kotor that is a short walk from the Old Town. We didn’t venture to the beach since we didn’t have a ton of time in Kotor but it’s there if you want to lounge around! The beaches close by are mostly rocky ones (like most in the Adriatic) and in front of the hotels at the water’s edge. If you want sandy beaches, you might consider driving the coast down to Budva or Ulcinj! The zigzagging pathway of the Ladder – there is apparently 72 switchbacks in total! If the fortress isn’t high enough for you and you really want to get a workout, then you can climb the mountain behind Kotor via the Ladder of Kotor. The trailhead is close to the North Gate of the Old Town (the free entrance we talked about up top) and the trail is the well-marked switchback you can see from the fortress. The change in elevation is 940 metres so make sure you have lots of water before you begin. Depending on your fitness level and how many photo breaks you take, the entire hike can take you a few hours. There are even more paths that continue on but just the Ladder is to the top of the ridge where you enter a pine forest and end up at the P1 roadway. It’s right around the corner to the right – just outside the photo’s frame. But enjoy the view anyways! 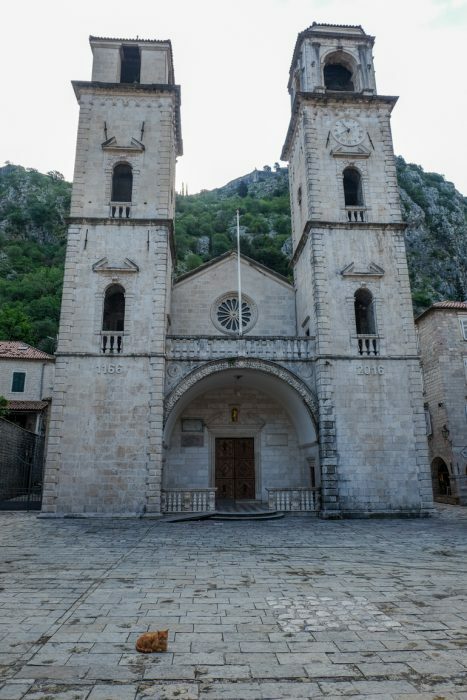 If you’re in the Bay of Kotor, one of the most popular attractions is visiting Our Lady of the Rocks islands. There are two smaller islands, one of which has the church of the same name on it. That island is actually artificial, and it was made by sailors over hundreds of years. Eventually, a church was built on it and now visitors come from far and wide to see it. You can visit the church and the small gift shop on the island. But make sure you are very respectful because the island plays a huge role in the cultural and historical significance of the area. Getting there can be tricky in the summer season since there are many boat options and tours that are scheduled so it’s a good idea to book something in advance if you know you want to see the Bay of Kotor and the islands. Here is that highly-rated boat tour again that can take you there if you’re interested! If you’ve been following along our out Balkan adventure you’ll know that we absolutely fell in love with the flaky pastry in every country we tried it. 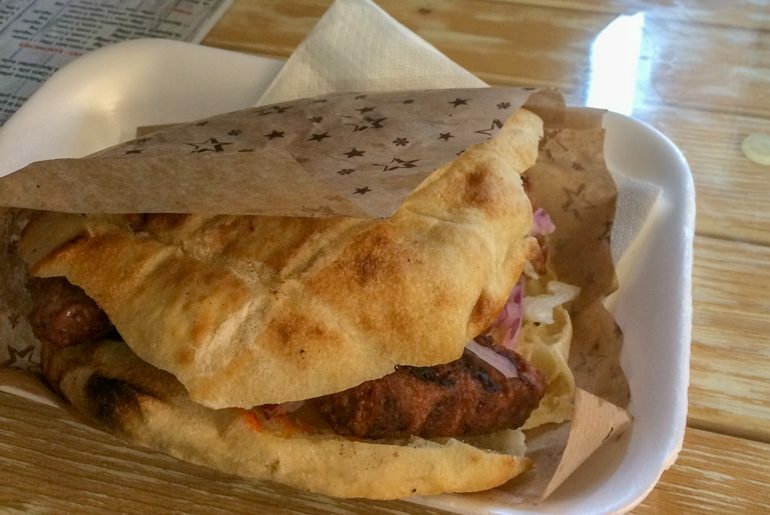 First it was Montenegro, then Bosnia – we ate it in Sarajevo and in Mostar. Wanting a cheap breakfast one morning, we asked the hostel guys where the best bakery was. He said to leave the North Gate and so we did. We had the classic cheese one and a classic meat burek and it was pretty good! We actually tried two places – both were outside the Old Town. The one was just outside the North Gate (as mentioned) and the other one we went to before getting on the bus was the outside the South gate between the roundabout and the bus station. Both are so local that we can’t even find the address on Google Maps. So, you know it’s good! 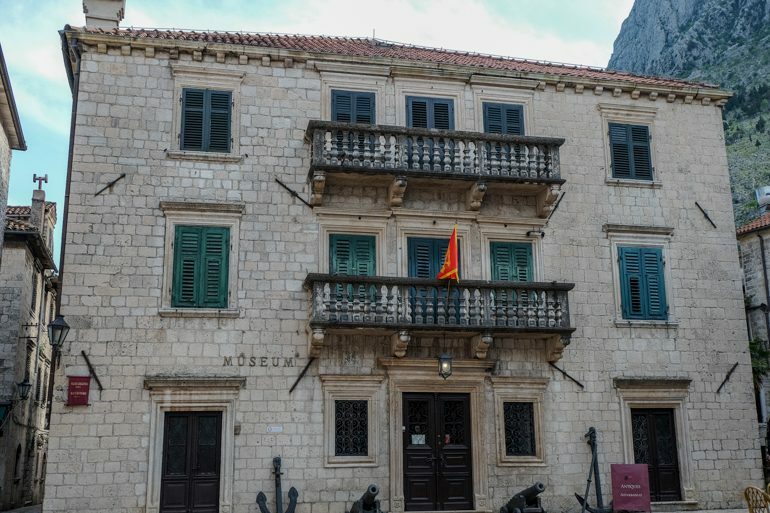 There are a few museums in the Old Town that you can check out. We don’t usually go to museums unless we’ve heard about it before and it really interests both of us. That said, there are two in Kotor that might be of interest! This is a cat enjoying the view. Seemed topical when discussing the Cat Museum. Lisa has actually read up that there was a Cat Museum in Kotor and we kinda laughed. Well, turns out it’s a pretty good attraction and we missed out. Cats play a significant role in the history of the region. There are also loads of vats just laying around the old town in places you wouldn’t expect there to be a cat. One time we rounded a corner and there was (honestly) like 7 cats just laying on the sidewalk. So, if you want to learn more about visiting the Cat Museum, you can check out the official website. If you don’t like cats, then maybe don’t visit Kotor. We didn’t go into the Maritime Museum but it was so pretty it always caught our eye. Another museum that we intended to check out but didn’t get the chance is the Maritime Museum. Obviously, the coastline and the Bay of Kotor come with it a boat load (pun intended) of history that relates to the sea. From fisherman to traders, smugglers, and actual pirates – the waterways of Montenegro have a rich past that is fascinating to learn about. You can learn about this history, and more, in the museum. 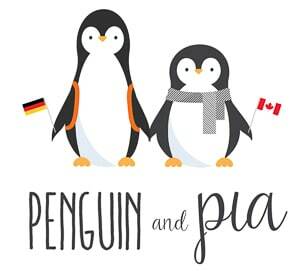 Here is the website for the opening hours and other information! 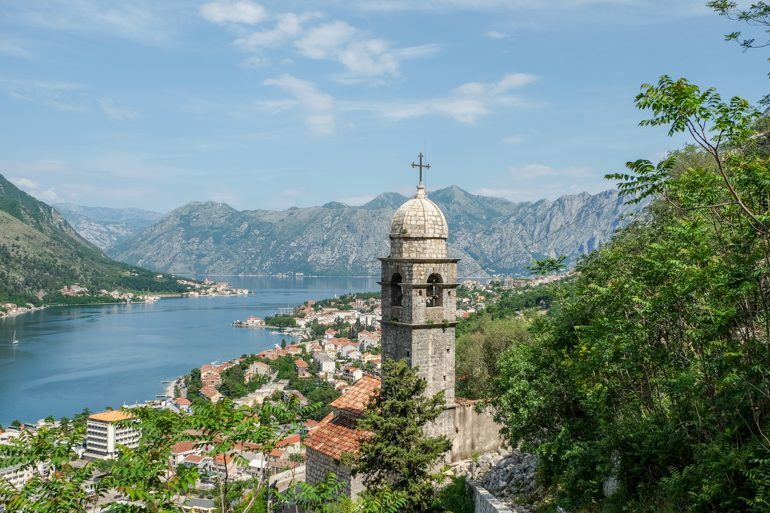 And there you have it – our take on some of the best things to do in Kotor. 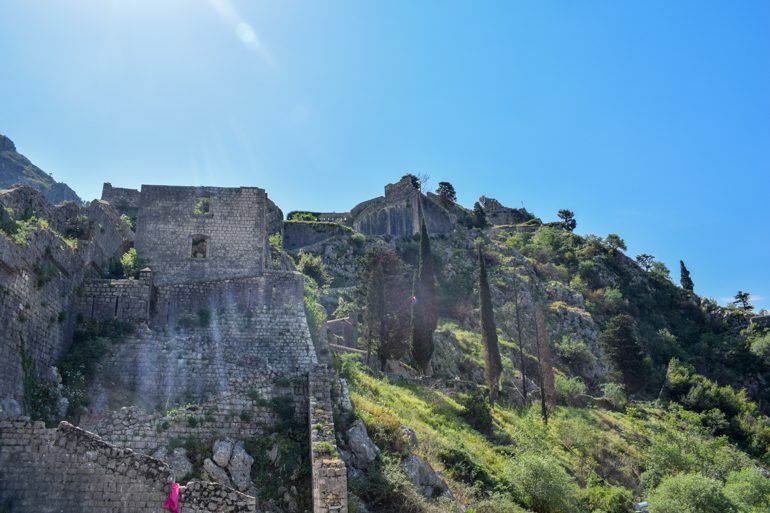 We had a great few days in Kotor and we’d definitely recommend checking it out – if not for the Old Town then for the hikes and history of the surrounding area. 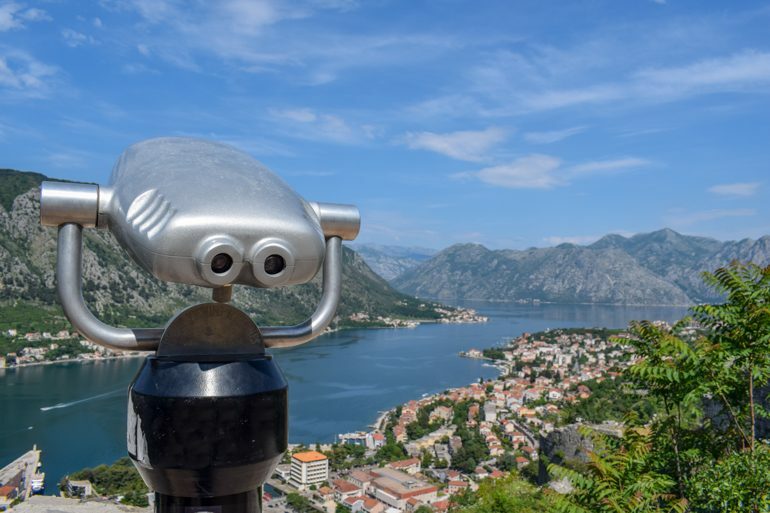 The Bay of Kotor has lots to offer travellers of all interests and it’s a great way to see what a piece of Montenegro is all about!